Long Bar Pointe is the last unspoiled mangrove shoreline on Sarasota Bay – and needs your help. A new housing development called Aqua by the Bay could threaten this irreplaceable treasure. It comes up for a vote at the Manatee County Commission May 4. By signing this petition, you will be urging the commissioners to deny the General Development Plan for Aqua by the Bay. Dredge a lagoon 2½ miles long right behind the mangrove fringe. Erect a seawall behind the lagoon and 2,900 homes above the seawall. Build at least one building 145 feet tall – four times the legal limit. Install dozens of docks along the shore. Trim of more than a linear mile of flourishing mangrove forest. Impose a conservation easement overriding Manatee County’s authority on its own coast. Violate a multitude of local wetland protection laws. Devastate the mangroves and their ecological function. Endanger the healthiest seagrass, best shorebird habitat and finest fishing ground on the Bay. Destroy the character of this peaceful Old Florida coastline. 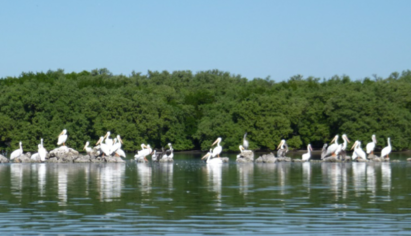 With your support, the Manatee County Commission can save the last great place on Sarasota Bay. By supporting this petition, you can show our commissioners that our community stands firm against this approval and request they use our land development rules as intended to protect our valuable environment, and deny this development. Thanks for your help – Manatee/Sarasota Sierra Club and Suncoast Waterkeeper.